We start with the foundation of the courtyard and tabernacle. How did these structures stand so uprightly in desert sand? The answer to this question begins with a sacrifice that all the men 20 years of age or older in the camp of Israel were commanded to make: a ransom offering of half a shekel, no more, no less. All the materials required to construct the temple were donated through freewill offerings, except for this required silver of the ransom or atonement offering. The silver was melted down and formed into rings for the curtains to hang on and for sockets that the large posts along the courtyard and tabernacle perimeters would be set upon (Chapter 5, 'Made According to Pattern', by C.W. Slemming). See Exodus 30:11-16 and Exodus 38:25-28. The silver shekels were a ransom for the men who were counted among the army of the camp of Israel, to pay in advance for their sins. They were promised if they paid the offering, that there would "be no plague among them" (Ex. 30:12). Silver represents redemption, through sacrifice, the price paid for atonement. Sacrifice and redemption are part of the foundation of the plan of salvation. Men were bought and sold with silver: Christ was betrayed for 30 pieces, Joseph sold into Egypt for 20. Christ's work is to redeem us from the fall, to save us from the effects of our sins through faith on His name. He can set us free from the eternal effects of our sins as we believe in Him. Alma 11:40 "And he shall come into the world to redeem his people; and he shall take upon him the transgressions of those who believe on his name; and these are they that shall have eternal life, and salvation cometh to none else." The camp of Israel lived for many years in the desert. The tabernacle could not be erected on a foundation of sand. Therefore, the silver sockets became the foundation of the tabernacle. There were 100 sockets, each weighing 125 pounds. 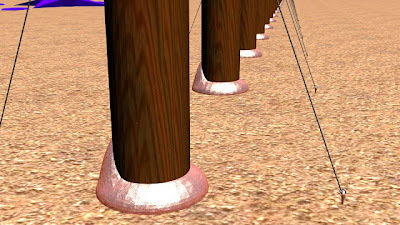 Boards were inserted into 96 of them and the other four were for the pillars supporting the veil of the tabernacle. Collectively, this created a foundation weighing 6 tons. The tabernacle and worship in ancient Israel were symbolically founded upon symbols of sacrifice and redemption. They were spiritually kept apart from the sandy soil and foundations of the world, whose philosophies and doctrines are always shifting and changing. The silver sockets allowed the spiritual focus of ancient Israel to remain immovable, strong, and enduring. Likewise, we too should build the spiritual foundations of our lives upon the redemptive and atoning work of salvation wrought by our Savior Jesus Christ. "Among the many species of fish found in the Sea of Galilee is one called the musht, commonly known as "Peter's fish". The male...has a habit of carrying the young in its mouth, and of sucking them in in a time of danger. Sometimes it will carry a stone or other obstacle to keep the young out. The musht has been found to have objects other than stones in its mouth. They are attracted by bright objects, and even coins have been picked up by them." 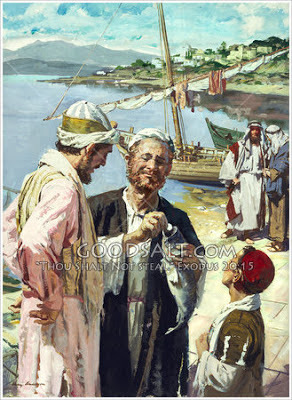 Here is the miracle: 1) that Christ said, take up the first fish. There are some 40 or more species of fish in the Sea of Galilee of varying population sizes and 2) that the fish would have a piece of money in its mouth that was worth the price of the temple tax for two. Remember, the temple tax originated with the ransom offering, an atonement offering for the sins of those enlisted in the armies of Israel. Christ's miracle here was that he, whether Peter knew it or not, had paid the price for Peter's sins. Soon, Christ would pay the ransom for redemption, in advance, for all of mankind's sins.